We believe a strong brood ewe base is the foundation of it all. We have developed our brood ewe base using the same principles we used for 40 years in the Columbias-OBTAIN THE BEST EWES YOU CAN, TO LAY YOUR FOUNDATION. The group of ewe lambs that we bought in 2010 from Zane & Corrina Tally really gave us a jump start when bred to the outstanding rams, SWP 07-145 and SWP 10-103, we purchased from John Stromquist. These sheep and their offspring, along with the purchase of a group of brood ewes from MVF, select individuals from Buckeye Acres, Hillcrest, and others, plus the great opportunity in 2013 to purchase the entire Stromquist White Post Farm flock has formed the nucleus of our foundation flock. We are striving to utilize these strong genetics from superior outcrosses into a line breeding program that will consistently produce top producing and easy care sheep. 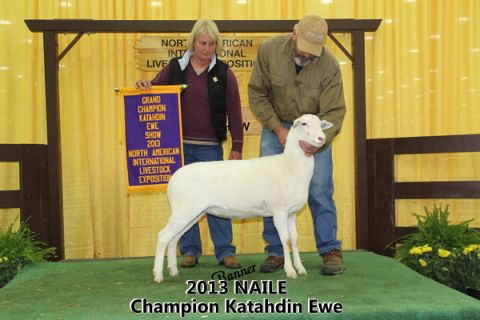 Fall of 2013 we lambed 110 ewes in the month of October and have lambed another 170 mature ewes January- March. Our sheep grow quickly and are critically selected for structural soundness and production. We want a sheep that can perform for you on the farm and in the show ring. We do not select for or against color in our sheep, but every so often a really cool one pops up. Check with us for ALL YOUR BREEDING STOCK NEEDS.